“You can’t stop the beat ” in this enormously successful musical comedy which is the perfect way to end the season. Hairspray is the genuine “feel good” musical. With an explosion of hit songs set in the heady days of the 1960s, the story follows the fortunes of teenager Tracy Turnblad- a big girl with big hair and an even bigger heart as she pursues her dream of stardom on a local TV show. On the way she inspires her mother, Edna, the local communities and of course, wins the boy she loves. Hairspray was nominated for a record breaking eleven Laurence Olivier awards winning Best New Musical and three others. The musical was made into an equally successful film starring Jon Travolta as Edna. This breathtakingly dynamic musical combines the wittiest and funniest of stories, fantastic dancing and a fabulous musical score including Good Morning Baltimore, Big Blonde and Beautiful, Without Love and of course, You Can’t Stop the Beat. Relive the fun of the 1960s in this blast of a show! 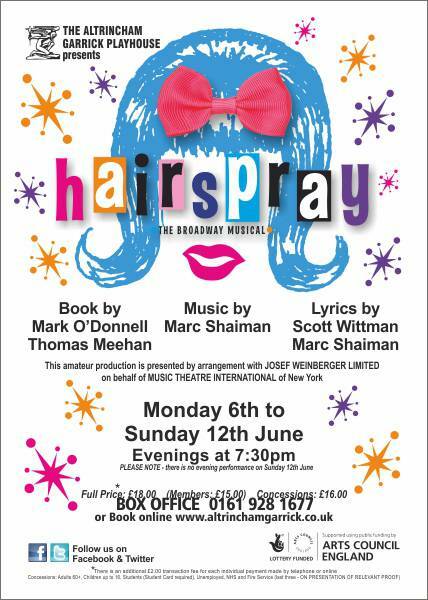 THERE’S one song in Altrincham Garrick’s production of Hairspray that is so stirring, so moving and so well sung it’s worth the ticket money on it’s own. The number in question is I Know Where I’ve Been, performed with heartfelt passion by Nicole Battick, who plays Motormouth Marybelle, I was very nearly in tears. With a voice as soulful as this, many Trafford musical societies are sure to be clamouring for the vocal services of this very, very talented performer. The song epitomised the serious story that runs alongside that of Tracy Turnbald, an ordinary girl-next-door who dreams of being famous courtesy of a hilariously superficial teen music show. Hairspray is set in Baltimore in the early 60s and while you’re sure to leave the theatre on cloud nine, it also pays tribute to the courage of those involved in the black civil rights movement. As Tracy, the daughter of a mother with flouted dreams, Olivia Tringham is every inch the unlikely heroine as she battles against catty teenage girls and an education system that, despite her tender years, has dumped her on the scrapheap. You’re sure to find yourself willing her to live happily ever after with wannabe pop star Link Larkin,? played by the likeable and charismatic Michael Twigg. Whether he’s on the stage or working behind it, director Charlie Tomlinson is consistently brilliant. So too are Andrew Lee as Tracy’s pantomime dame of a mother and Ivor Farley as her equally lovable dad, Wilber. Add an infectious musical score and some laugh out loud jokes and you have the complete musical package. What a way to end your current season, Altrincham Garrick. Congratulations, to you all. HAIRSPRAY?S a happy choice for the Garrick?s end of season musical. Filmed in 1988 and 2007, it sits more comfortably on a stage. It?s so comfortable on the Garrick stage, it makes the Garrick seem more like a musical theatre than a playhouse. Set in 1962 Baltimore, the Marc Shaiman//Scott Wittman musical features big haired, overweight Tracy Turnblad (Olivia Tringham) who longs to become a dancer on the Corny Collins? Show. Eventually, she and her friend, Penny Pingleton (Abigail Harper) are auditioned. Tracy gets the job and eventually the love of teenage heart throb, Link Larkin, (Michael Twigg), a would-be Elvis with a great voice. Olivia Tringham portrays a caring and enthusiastic Tracy who eventually wins her fight against discrimination. She sings catchy songs such as her opening number, Good Morning Baltimore and Welcome to the Sixties with her mum. Tracy?s loving parents are played by Andrew Lee as her mum and Ivor Farley as her dad. Their duet Timeless to Me is warm and funny. Andrew does well to dress in glittery frocks, wear high heels and dance. The baddies are Amber Von Tussle and her mother, Velma, racists who resent Tracy?s campaign to promote black talent. These two are portrayed in pantomime fashion by Clare Louise Garrett and Stephanie Niland. Amber?s pouting resentment at Tracy?s success is classic. Nicole Battick?s Motormouth Maybelle has a voice which stands out especially when she sings I know Where I?ve Been. Thanks to choreographer, Debbie Norris and her assistant, Jess Hill, the non-stop dancing to Daniel McDwyers? musicians, is well co-ordinated in this riot of fun, romance, colourful costumes and dramatic wigs. The Altrincham Garrick have ended the 2015/16 season on a high with their energy filled production of Hairspray. Based on the 1988 film starring John Travolta this musical burst onto the stage in 2002 and has been delighting audience around the world ever since. Later this year a live television version of the show is to be broadcast in the USA starring amongst others Jennifer Hudson. In 1962 Baltimore, Maryland, plump teenager Tracy Turnblad’s dream is to dance on The Corny Collins Show, a local TV dance program based on the real-life Buddy Deane Show. When Tracy wins a role on the show, she becomes a celebrity overnight, and meets a colourful array of characters. She then launches a campaign to integrate the show. Hairspray is a social commentary on the injustices of parts of American society in the 1960s. The production at the Garrick has been skilfully and thoughtfully cast and directed by Charlie Tomlinson with each pairing playing perfectly off each other. Tracy (Olivia Tringham) almost steals the show with her high energy portrayal and her relationship with Link Larkin (Michael Twigg) is totally believable from the moment they bump into each other at auditions for the Cory Collins (Jake Robson) Show. Tracy?s best friend Penny (Abigail Harper) is also played well although I would have like to see a little more of a transformation from plain Jane to temptress at the end when she finally gets to dance in public with her coloured boyfriend Seaweed (Stephenson Ardern-Sodje). Penny?s mother Prudy is wonderfully portrayed by Christina Williams who also plays the Gym Teacher and Matron during the evening. TV producer and villain of the piece Velma Von Tussle (Stephanie Niland) and her spoilt, selfish daughter Amber (Clare Louise Garrett) are an absolute joy to watch throughout and never once stray out of character even when out of the spotlight. I have been fortunate to see many a production of Hairspray and can honestly say these two were one of the best pairings I have seen. The role made famous on screen by Travolta and later on stage by Michael Ball is that of Tracy?s mother Edna. Tonight Andrew Lee took on this role with gusto and confidence. With a great voice and delightful on stage relationship with Wilber (Ivor Farley), her husband, their duet of ?You?re Timeless To Me? was one of the highlights of the show. But for me the star of the show was Nicole Battick as Motormouth Maybelle. She commanded the stage whenever she was on it and her performance of ?I Know Where I?ve Been? was by far the stand out performance of the night. As I mentioned above I have seen many a production of this show and Battick?s performance of this number is second only to Brenda Edwards who recently starred in the UK national tour. A simple set, somewhat similar to the last UK touring production served its purpose well and provided ample room to show off the choreography from Debbie Norris which was pretty much faultless in the group numbers. Special mention should also be made to MD Daniel McDwyer and his band. Somewhat too loud in places they sounded incredible and deserved their applause at the end of the night. There however was a frustrating side to this production, the lighting. It seemed to me that they were trying to do too much with it. At times it completely missed the action it was supposed to illuminate and at times it was way too much with seemingly random flashing lights in the audience. The use of the moving lights as spotlights totally failed also as they didn?t keep up with their intended targets on stage in most cases. Good old fashioned hand operated spots would have been so much more effective here. However, in criticising the lighting this could not take away the passion and drive of those performing on stage. This show was a joy from start to finish and despite the heat in the auditorium (and many more around the country tonight) it did not lack one ounce of energy, although they must have been melting on stage. I am already looking forward to the 2016/17 season which goes on sale next month at this gem of a theatre.